As with other things, I like to tackle any sort of lift problem by first checking the possible causes that are No-Cost or Low-Cost items. So, how's the weather? There's a good reason to talk about the weather, it affects everything. 1 - Has it rained or been humid recently? 2 - Did it freeze last night? 3 - Is it below freezing now? 4 - Do you leave your tractor parked outside? 6 - Has it been more than a year since the fluid was changed? Almost left this one out. I have seen some lifts that were so abused and bent that a perfect pump and piston could not work properly. Straightening and repairing the lift arms and other hardware is mostly just time and energy. If someone has substituted bolts where there should be pins, replace them with the correct hardware. If you don't have tools to straighten what is bent, new parts are available. A shop press is ideal, but creative use of a floor jack or bottle jack and heavy chain can straighten lots of parts. Any improvement will help. BE CAREFUL! Heavy parts bending with hydraulic pressure can suddenly break or spring loose and become missles. Don't put your body under or in line with any force you are employing. I got in the habit of wearing safety glasses 100% of the time in my shop. Wear them enough and you forget you have them on. Water in the hydraulic fluid is very bad. First, it causes rust and corrosion. Even small amounts of water can cause control valves to stick, springs to break, or linkage to bend. The main reason we have to replace the fluid is the amount of water that eventually has mixed with it. Anyone who believs oil and water do not mix should be shown a sample of the thoroughly mixed chocolate latte that we drain out of these sumps when it's past time for a fluid change. Working the tractor gets the fluid very warm. Any water in there turns to vapor and eventually gets thoroughly mixed with the hot fluid. How does water get inside the sump? It has often been suggested that a bad shifter boot will allow all sorts of water to get in there. WRONG! That is not true for any of the ford tractors I have. The shifter is a ball and socket that seals fairly well. The transmission slings oil around inside the housing, so the shifter ball and socket is usually well lubricated. Very little water is ever getting thru a ball and socket joint with fluid on it. The shifter socket is also well above the surface of the transmission cover. Water isn't flowing thru a damaged shifter boot into the sump. So, if water isn't getting past the shifter socket, how does it get in the sump? Condensation. The fluid level in the transmission/hydraulic sump is way less than half full. The rest of that space is air and metal. Unless you live in a very dry climate, humid air will get in the sump. When the air cools moisture condenses on all those cool metal surfaces inside the sump. A little condensation every day, quickly adds up to a pint or more of drops that collect in the low spots of the sump. Think about how much water one ice tea glass can leave on a table. Now, multiply that by however many ice tea glasses it would take to equal the surface area of metal that is inside the tractor sump. Water is heavier than oil, so this condensation runs down and collects at the bottom of your sump (where the pump is located). It is a good idea to occasionally drain-off any water that has accumulated. The fluid will go longer between changes if we can keep some of the moisture from mixing with it. Draining this mosture is easy to do. Water will drain past the threads of the drain plugs, oil will not. Crack a drain plug and turn it out about half a turn. Any water in there will almost immediately start running. When it stops, tighten the plug. The most important plug is the one at the pump. If you only have time to do one, do that one. Do not unscrew the plugs to try and get water to flow faster. Go just a little too far and you will get several gallons of fluid in the face or running down your arm as you frantically try to thread the plug back in. Any moisture we can drain off this way will not be in there to mix with the fluid when it warms up. The fluid will look good and work well much longer between changes. Water is bad, ice is worse. If temperatures have been below freezing, the water will freeze. The worst spot for that is the drain plug where the pump is. Ice could block passages that allow oil to get into the pump. Ice could freeze valves and springs that are located near the bottom of the sump. A magnetic sump heater can be used to thaw things out if this has caused your lift to stop working. A really hard freeze could actually crack something. Draining water as it collects in the sumps can help to extend the fluid change interval, but fluid does not last forever. Dirt and other contaminants collect in the fluid and there is no filtration to remove them. Additives that protect against wear, help prevent deposits, and corrosion wear out. The Operator's manual says to change the fluid every 600 hours. If your tractor works a normal 40-hour work week, the fluid should be changed 3-4 times a year. Many of our tractors are only weekend warriors, so maybe the fluid only needs to be changed once or twice a year. Make an honest estimate of the hours your tractor is used each week. Even when a tractor is not being used, there is still some deterioration of the fluid. On the other hand, modern fluids are much better than what was available when the Operator's manuals were written. Weigh those facts, and it probably works out that even a lightly-used tractor should have the fluid changed at least once a year. Looking at the condition of the fluid when checking the level can help indicate when the fluid should be changed. Extending or neglecting to do fluid changes only guarantees thaat there will be problems. The short answer is: USE THE UTF THAT IS BEST FOR YOUR TRACTOR AND BUDGET. Just read the labels. The N tractors have a common sump for the rear end, hydraulics and transmission. Therefore, the fluid used in these Ford tractors is a combination gear lubricant/hydraulic fluid. Today this fluid is generally referred to as Universal Tractor Fluid or UTF. There are LOTS of UTF products available that will work ok. Some are much better than others, but most are far better than what was available when these tractors were built. Any SAE 80 or 90 weight UTF that says it's for a common sump with hydraulics and transmission gears will work. None of them will probably ever cause noticable damage unless you use your tractor way more than average. The original fluid recommended by Ford for the 1939 9N tractor was “Straight Mineral Oil, SAE 90"”. For winter use in really cold climates SAE 80 could be used. The least expensive UTF products will likely match up with this one. Now for the long answer - If you just want something that will work and cost the least, skip the rest of this narrative unless you really want to know more than any sane person wants to know about slippery stuff. Lubricant technology greatly improved after 1939. Around 1950 Ford changed the fluid recommendation for all N-tractors to: “Mild EP GEAR OIL conforming to Ford specs M4864A (SAE 80) (below freezing) or M4864B (SAE 90) (above freezing)”. This fluid would correspond to the now inactive API Gear Oil designation GL-3. 1 - If you are on a very tight budget, using the least expensive UTF "Straight Mineral Oil" equivalent to the old GL-1 spec won't cause anything horrible to instantly happen to your tractor. Basically, look for the cheapest pail that says it's good for a combination sump with gears and hydraulics. It will work ok but probably won't be a good year-round fluid. 2 - Any UTF that says something like "replacement for" M2C134D or NH-410B should be a much better lubricant than the cheapest stuff and will certainly work OK. When shopping for a mid-grade replacement product beware anything with a really long list of products it can replace. Many of these may indicate they meet or exceed the obsolete API GL-4 spec. Look for something that uses "premium" 10W30 multigrade base oil for a product that will work ok year-round. 3 - A premium synthetic that says it "MEETS" NH-410B (M2C-134D) is going to be the most expensive option, but it is also going to be the best all-season fluid and lubricant. This is the latest spec that Ford and New Holland have recommended for tractors with a common sump. In the united states the New Holland Agriculture web site still allows looking up and ordering parts for N-Tractors. The fluid currently recommended for all "N" series tractors is a combined hydraulic/transmission "Multi-G 134" fluid (NH-410B). The NH-410B is the current CNH OEM specification that is equivalent to Ford ESN-M2C-134D. This combined hydraulic/transmission fluid is a modern synthetic product with additives that works well as both a hydraulic fluid and gear lubricant. Any product that "meets" the NH-410B specification is much better than any straight mineral oil "GL-1" or M4864 "GL-3" fluid that many N-Tractor owners still insist on using today. Traveller® Ford Tractor All Mineral SAE 90 Ford Tractor Transmission Fluid. This is as close as you are going to find to the originally recommended fluid for the 9N and 2N tractors. This is probably going to be the least expensive fluid available. If you are on a tight budget, or have 6 tractors that need changing, this may be the one you buy. This is certainly not the best fluid available. Remember, the fluid recommendation has been upgraded twice since any of the manuals said "straight mineral oil". Shell Rotella® HD Tractor Transmission and Hydraulic Fluid meets API service GL-4. This is a UTF, but it does not meet M2C134D. Traveller® RENEW for Older Tractors, Universal Tractor Trans/Hydraulic Fluid. This is a UTF, but it does not meet M2C134D. Traveller® Premium Universal Tractor Trans/Hydraulic Fluid. Same as above. Read the label carefully. This one may say something like "recommended replacement for" Ford M2C-134D fluid. Who makes this recommendation? 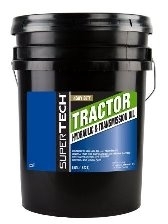 Super Tech Heavy Duty Tractor Hydraulic and Transmission Fluid sold by Walmart® says right on the label "meets Ford New Holland ESN-M2C134-D specification". This is the right stuff! Unfortunately, our local Walmart only has this in one or two gallon size containers, and usually only has one or two on the shelf. That's not much help when I'm looking for a 5 gallon pail. A premium synthetic that says it "MEETS" NH-410B (M2C-134D) is much thinner than 80 or 90 weight gear oil. It's similar to a 10-30 multigrade motor oil thickness. This means it works better as a year-round fluid. No warm-up needed on cold winter mornings to get the lift to work. No problems with cavitation for my live hydraulics external pumps. Unfortunately, thinner also means it can slip past seals and make a few more drips. A weak lift may not work at all with synthetic fluid. For a trailer queen, we would rebuild all of the seals and stop the drips. My tractors are working tractors. I don't mind if they mark their territory with an occasional drip. If a leak gets worse than a few drips, fix it. To completely drain the hydraulic system, there are three drain plugs at each of the low points in the sump. Two large plugs under the transmission, and hydraulic pump, and one smaller pipe plug under the differential housing. There is only one filler cap located on top near the gear shift lever. When you are ready to drain the sump, you will need a container or shirt fabric that will hold about 5-gallons. When changing the fluid, try to flush as much of the sludge as possible out with the old fluid. Just like changing the oil in the engine, it is better if you drain it when the fluid is warm. It runs out quicker and more "stuff" is suspended in it. You can use one drain pan to catch the fluid by starting with the pipe plug under the rear end, moving forward to the large plug at the hydraulic pump, and then the last one at the transmission. I used to start with the small pipe plug at the back. That left only a small amount to drain from the two really big plugs. Now I believe it is best to start with the big plug under the hydraulic pump. This can create a really hugh mess but draining most of the fluid thru that hole will flush as much dirt as possible out of the hydraulic pump area. Some people recommend flushing the system with kerosene or diesel fuel. If you plan to flush it anyway, drain the plugs in any order you want. Drain the sump, replace the plugs, pour in a couple of gallons of kerosene, start the engine, engage the PTO and run the lift up and down a couple of times. Then remove all three plugs, and let it drip into pans overnight. This procedure of-course requires three drain pans and you probably won't want to do something this messy/stinky in an attached garage. The fluid we find in most of these tractors is often sadly neglected. It may not have been changed in many years. All of my tractors had a layer of nasty sludge in the sump that was not going to come out with any ordinary flushing. I dropped the belly pump and removed the hydraulic top cover. This allows the pump to be tthoroughly cleaned by hand and provides some big holes to work thru to clean out the rest of the sump areas. Once the sump has been completly drained, make sure all three drain plugs are tight, then remove the bottom bolt from the side inspection cover that has the hydraulic dip-stick (the tractor must be parked on level ground). Start filling the sump. STOP when the fluid begins to leak out of the bolt hole. That is all you need, any more will just leak past the axle seals and get on your brakes. It usually takes 4-1/2 to 4-3/4 gallons not 5 as stated in the owners manual. Pull the dipstick and see where the level is. If necessary, make a new mark that corresponds to the correct level. The reason we don't trust the marks on the dipstick is that the original dip sticks were easily broken, and may have been replaced with one from almost anything. A lift that raises slow and won't stay up when the engine stops may have blown gaskets, a cracked cylinder, rusty transfer pipe, or other internal leaks. Attach a heavy implement (anything weighing at least 150 pounds should be enough). Remove the right inspection plate that has the hydraulic dip-stick. Start the tractor, press the clutch, make sure the PTO is engaged. The PTO shaft should spin when you release the clutch. Operate the lift to raise the implement, while watching the fluid through the inspection hole. Look for leaks coming from above. Small leaks have a tendency to get bigger, but you should be able to judge if your leaks are bad enough to have to remove the top cover and fix them. Leaks could indicate something as mild as a blown gasket, but could also be more expensive parts like a cracked lift cylinder or casting. A mirror can be used to try and pinpoint where the leak is. Look at the area around the small steel pipe that transferrs pressure from the pump to the top cover. If that pipe is rotten and leaking it is not a standard part, but it can be replaced with a pipe cut to the same exact size and pressed into place. Look for places where the gaskets may have blown out. Removing and replacing the pump and top cover are relatively simple proceedures that are covered pretty well in the I&T FO-4 manual. The only things I can add is that it helps to have two people. It is hard, but not impossible, to do both with only one pair of hands. An overhead lift and floor jack are a great help. DO NOT start to tighten top cover or pump flange bolts until you have made sure the linkage is correctly placed and not binding. Never force anything! If it won't go easy, stop and figure out why. Refer to section below regarding linkage. While you are looking for leaks, you should see some indication that fluid is being sucked into the pump from the sump. No leaks, and no indication of suction, could be stuck valves or something major broken in the pump. FIRST push the clutch in and make SURE the PTO is engaged. Drain off some fluid to expose the top of the pump. This should allow you to see if the excentric cams and pistons are moving properly. There are two piston assemblies that should move at the same time, and in opposite directions. A "chuckling" sound under load usually means the excentric cams are worn but the pump can make a lot of noise and still work ok. Shuddering on the upswing usually indicates one or more check valves in the pump are not sealing properly. Rebuild kits can be purchased in various stages depending on what needs to be rebuilt. Once again, I have little to add to the diagnostic and repair proceedures in the I&T FO-4 manual. Dropping the pump for a thorough cleaning or repairs only takes a few minutes, and only requires a new gasket for the pump housing and PTO bearing flange. Drain the sump. Remove the PTO shaft. There are four bolts around the PTO bearing flange. Remove those and the shaft pulls straight out the back. Check the bearing. If that is loose or the seal was leaking, plan on replacing the bearing and seal while you have it out. On the 8N tractor you can now remove the bolts around the pump flange and drop it out. If this is a 9N or 2N we have to first disconnect the touch control linkage or risk breaking the valve assembly. The two-sided linkage on the 9N/2N is a much bigger pain in the rump to get hooked up than the single-ended linkage for the 8N. With the early linkage you have to grab both pieces and stretch them into place. I've done this with the seat removed, laying on the tractor, with an arm in each hole. You will want to do this when the wife isn't around. There is no way to explain why you were hugging your tractor with one arm in each inspection hole. There has got to be a better way. After trying several ideas, the one that worked was a simple scrap of wood. The scrap was cut to 0.375" x 0.75" x 3.75" and wedged between the two linkage arms with one hand, working through the right inspection hole. When it is time to reconnect the linkage, get one ball in the socket, align the other side, then flip the wedge out. Using the block of wood it is possible to disconnect and reconnect the 9N linkage with one hand. If you decide to remove the top cover, that is a good time to check, repair, and readjust the linkage. I can add very little to that procedure. It is possible to repair and adjust your lift using just the instructions in the I&T FO-4 manual. The 9N-2N lift is much simpler with only one external adjustment. The most common problems with the 8N linkage are wear and bent linkage. Look at the 8N link that goes down to the valve. It should be straight. If that link is bent, it needs to be straightened in a vise or press. The 9N-2N linkage is different and not usually bent. 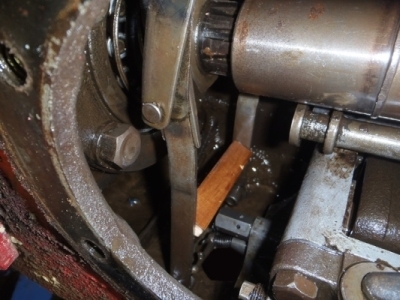 However, before removing the top cover or dropping the pump out of the 9N-2N tractors, the linkage must be disconnected or it may break the valve. On 8N tractors the ball on the linkage rod just pulls right out of the socket as the top cover or pump are removed. Reinstalling a cleaned, replacement, or rebuilt pump can be tricky. The pump has to be wiggled up into place and then the front edge of the pump overlaps the front lip. It helps to have something like a block of wood under an elbow or a floor jack to help hold the pump when it does not go in perfectly on the first try. Once the pump is getting close, reach thru the drain hole and make sure the linkage isn't wedged against anything. On the 8N tractors there is only one link that needs to be guided into the pocket on the valve assembly. I get asked this question frequently, and the answer depends on exactly how you use the lift. The 3 point lift will pick up a lot more weight close to the tractor, than it will out on the end of a boom pole. It also depends on how much weight you have on the front end. With about 800 pounds on the lift arms, the front tires start to come off the ground. I've seen a 1200 pound round bale on a 3-point bale spike on the back of an 8N, but he also had a loader bucket on the front to help balance the weight. It can be done, but I think that qualifies as abuse. This one is a separate page Live Hydraulics. Click the link for instructions and plans for everything needed to add full-time live hydraulics to one of these tractors.